Basic Yoga Workout For Dummies is a fine instructional DVD with a yoga expert, Sara Ivanhoe, who patiently and respectfully teaches basic yoga and even some intermediate yoga exercises to help people get fit. Sara Ivanhoe presents the material in a non-threatening way to entice you to do the workouts; and the exercises move along at a good pace without ever being boring. Of course if you miss a point or two here and there you can always just re-watch that video clip as many more times as you like. The quality of the sound is excellent. Sara Ivanhoe starts the workout by giving you basic advice about getting set-up for the basic yoga workout: wear comfortable clothes; don't eat before exercising; drink water; exercise in your bare feet if at all possible; use a chair if you need one and much more. Excellent. The bulk of the DVD video is the basic yoga workout. Sara breaks this down into twelve smaller exercises which she calls "postures," "poses" or "the daily dozen." The video makes it so easy for you to follow along; you simply just watch how she uses a floor mat or a chair to do these twelve exercises. Watch and follow along and you'll learn the "cat pose;" the "mountain pose;" the "standing forward pose" (which helps to stretch); the "lunge pose" and other exercises including the "seated forward bend." The exercises become somewhat more demanding as you go along; this is very well organized. Moreover, Sara Ivanhoe gives excellent instructions that are extremely detailed. Great! One thing that seems to turn some people off is the use of the "icons" that come popping up on the screen; I think that this is a hallmark of the "...For Dummies" series. Personally, I think that sometimes they matter and sometimes they don't. The icons didn't bother me much but I can see and understand why some people would definitely find them annoying. There are four types of icons along the way: the "tip" icon; the "jargon alert" icon; the "remember" icon and the "myth buster" icon. If you find them distracting, rest assured that you can always watch the exercise again as many times as you want to get it down pat. In addition, there's another roughly 30 minute segment of intermediary yoga exercises. Sara Ivanhoe runs through these exercises faster because at this point she assumes you've mastered basic yoga; so don't start with these! The exercise Sara teaches is "the sun salute;" and she breaks this down into several steps to make the exercise manageable and easier to master. The sun salute uses a combination of breathing and movement together, just like basic yoga. Overall, I highly recommend this DVD for anyone who wants a relatively tame approach to exercise. According to Sara Ivanhoe, yoga can be done by just about anyone regardless of their situation. Naturally, if you have any concerns speak to your doctor first before trying these exercises. I found this DVD to be extremely useful and informative. After having been a yoga practitioner in my youth, I decided to return to yoga at my retirement and found this to be an excellent and well presented program. Finally, a Yoga DVD I'm not turned-off by! I was very satisfied with this video. It was my first try at Yoga. Sara Ivanhoe did a great job of explaining the correct form of each position and kept reminding the viewer to breathe, which if very important to get the full benefit of Yoga. She has a calming, soothing voice that encourages relaxation. Because of this video, I signed up for a Yoga class and have also bought another video by Ms. Ivanhoe. I have been doing Yoga for about 3 months now and have had incredible results. I have been mainly using Bryan Kest's Power Yoga series. I wanted to get my sister involved, but felt Bryan may be too fast and aggressive for her. I could not believe how good this video is! Also, the host is very pleasing to the eye. I would love to take a class with her - I wouldn't take my eyes off her. (yes, I am a guy). Get this if you want an introduction to Yoga and learn about basic poses. I really couldn't believe it when she explained Namaste! Good background learning here as well. If you are like me, new to yoga and fairly inflexible, then this is your best intro video. The others I have tried don't seem to understand the term "beginner" and try to plunge you into difficult postures and concepts to quickly. The instructor frequently reminds you that you should only move as deeply into the postures as is comfortable for you and that you shouldn't view the practice as competitive. Excellent use of video technology: modifications are offered in pop-up windows, either to increase the difficulty of certain postures or to make them easier. I give this DVD 5 stars for content and 2 stars for format. It's an excellent introduction to anyone who's interested in starting yoga. It's not too intimidating, too mystical, or too contorted. What it is, though, is too talky. Sara Ivanhoe does a fine job of instruction for anyone's first or second time through the workout, but after that, the workout is maddeningly slow for subsequent repetitions because of the extensive description given for each pose. Considering how much usable space is on a DVD, I see no reason why they didn't have one track for the initial instruction and then a second track for the actual workout. Also, as this is a "for Dummies" series, there are lots of the trademark cartoon figures and sound effects, complete with whirling sirens and buzzers. Kinda ruins the inner peace you're trying to achieve with yoga! I had wanted to try Yoga, even tried another tape at one time and just didn't care for it. My hamstrings are really tight, and I've always felt that I just could not do the exercises-- the other tape I did confirmed that opinion because it just jumped into major stretching without much warm up, and did not show any modifications. It also was a little irritatingly "new age"-- and though I know that meditation is a crucial part of Yoga, I was not interested in turning it into a religion-- which the other tape seemed intent on doing. So this tape, with it's no nonsense approach, coaxed me into liking it. Some of the stretching is hard-- I can certainly see why people like Madonna are so buff in the arm muscles-- it takes effort to do the poses for the 6 breaths you have to hold them. The instructor is not too "simperingly" sweet, but clear, precise, and friendly. No annoying giggling, or over coaching like a cheeerleader ("come on, you can do it, you deserve to be fit cause you're a great person" blech) I feel I can continue doing this workout for a while, learn the basics, and maybe move into more complex work, which the later half of the DVD provides. You should have a chair handy when you start, and maybe one of those easy to find yoga mats (I got mine half price at a discount store). Also, maybe a towel, and some sort of band (a belt might work, but they sell special yoga bands too) for one of the poses. Try to clear your head as much as possible-- since you have to breathe through your nose, if you have any allergies (which I do) try to control the stuffiness if you can. (I know that sounds weird, but it will make it more pleasant if you can do the breathing). There is an option on the DVD for instructor cuing only-- so you can play your own music and still get the cues. Finally, for people worried about calorie burning. According to a website that I use to monitor calories burned vs. activities (it's free-- write to me if you want to learn the URL) the 51 minutes of stretching yoga that this DVD/video gives you burns a total of 165 calories. You burn approx. 3 calories per minute. It's not exactly boot camp, and it is not cardio, but combined with a cross-training sort of program, this is a good light calorie burning day stretch. It's important, when you're trying to sculpt those muscles, to stretch them out. This video/DVD will be a crucial step to doing that. This may not be the DVD/video for people who are into the more spiritual aspects of Yoga, but she does address them some, enough for those of us who don't want to go too far into it. But it's a great one for getting started. The ONLY way to start yoga! Easy to learn! My husband has wanted to start yoga for a long time. We took out videos from the library, got books, even got a set of "yoga cards." The problem with all the videos was that they went way too fast, even if the poses were easy ones, you need some time to figure out where to put what, and get used to it. And watching someone do it is much better than reading about it in a book. I just bought this for my husband for Christmas, and now we're both doing it! It shows you 12 do-able poses, not all easy by any means, but easy enough for beginners to do without collapsing. She goes through them slowly and you really have time to figure out what you're doing. You feel like you could do it again by yourself. Only exercise routine that has ever worked for this uncoordinated couch potato! I admit it, I am a couch potato who spends most of her time on the computer, reading books, watching movies, or eating at restaurants with friends. I've hated exercising since childhood, since my nightmare days at gym class, where I simply could never keep up with what the other kids were doing. In the back of my mind, I always knew I had to get in better shape, so I've tried a few things over the years: sports, running, working out at the gym, and other tapes (Taebo, Pilates, etc) but nothing ever worked. I would try them the a few times, and but quit soon because I could never do the moves properly, and/or I would just get tired but see no real benefit. Over time, I realized that part of the problem is that I'm quite thin, so the real point of an exercise workout for me is not to loose weight (which many exercises today are geared towards) but gain strength. My sister suggested I try Yoga, as she says it had helped her tremendously with her strength. I was quite skeptical, and put it her suggestion off for more than a year. Part of my fear was that yoga poses seemed very complicated, and I'd just never be able to do them. But after I started getting low back aches a few months ago (and I'm only in my 30s!) I knew I had to do something before my body started deteriorating! After careful research, I decided to go with Basic Yoga Workout for Dummies. After all, when it comes to workouts, I am definitely very much a dummy. After working out with it for about a month, I must say, WOW! I can't be happier. Sara Ivanhoe presents in this video 12 beginner yoga poses designed to increase strength, flexibility, and improve relaxation, which was just what I wanted. The best part for me is the slow, calm detailed way Ivanhoe explains the poses, in a non-condescending manner. I really get the message that I'm really working out my own pace. Those who have more experience with Yoga, (or those who are not dummies when it comes to workouts and can pick up moves quickly) may find her detailed explanations boring, and wished the workout moved more quickly. However, I'm still struggling with the moves, and I am constantly learning new things from her detailed explanations. For example, in Mountain Pose, I just found out yesterday what it really means to stand with my weight centered on my feet, with thighs tight and drawn-up, belly in and tail bone down All these years, I've beens standing with my weight centered way back on my heels, belly out- a very unstable way to stand. Even though I know I am not doing each pose perfectly, I know I am still gaining a tremendous amount of benefit in terms of strength and flexibility. I love that my body is learning every day (shall we say its actually getting smarter?) and is now starting to tell me when I am doing the positions wrong! As an added bonus, I feel calm, relaxed, and clear after the workout, which often continues into the next day. As the other reviewers mentioned, the 'dummy' icons popping up in the middle of the performance are a tad annoying- the video would be better if they were not there. But I find I can tune them out, and its a small price to pay for having an workout routine that actually works for me. I knew this tape was a winner when actually I WANTED to work out with it. This was a new experience for me - actually wanting to exercise? Regularly?! Basic Yoga Workout for Dummies has made it happen. For those of you looking for a clear, calm, and nurturing introduction to yoga poses, this is an excellent DVD. Sara Ivanhoe is soothing and straightforward in how she teaches and enlightens. Beware, however, of the sound effects for the "Dummies" series icons that pop up and seem to go against the grain of yoga being this peaceful mind, body spirit meld. For example, you'll be getting into a pose when suddenly you hear "doinnnnggggg" alerting you to the "myths surrounding" yoga and other tips. It's something I just endured since this is part of the "yadda, yadda for Dummies," way. If that freaks you out, then this isn't the starter tape for you...just be forewarned. I didn't find it as hateful as some because I knew I was learning poses, not hoping to levitate. Also, if you're interested in a non-stop yoga fitness regime, buy an alternative DVD to have on hand once you have a better idea of what yoga is all about. 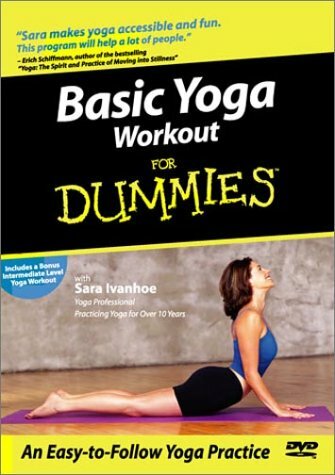 In that case, the title should maybe be changed to reflect what it really is "Basic Yoga POSES for Dummies. That having been said, I was relatively new to yoga and I didn't mind the pace of this introductory DVD at all, but I have since purchased a different DVD that puts all of the moves together. Great for beginners! Highly recommended! This is a great DVD if you're just getting started. The instructor adds light humor to keep you going thru the yoga practice (without being cheesy). She also adds alternative stretches for non-flexible people and for people with back problems. It's also set up so you can just do a few stretches at a time for hectic lifestyles, or you can do all of the stretches at once(about 1/2 hour). This DVD is fun and DO-ABLE! Sara Ivanhoe does an excellent job of explaining and demonstrating poses. She points out common mistakes and gives helpful advice on how to correct them. The twelve poses are a good foundation for a beginner doing yoga for the first time. It is worth watching - but only once. The problem is that she spends over a minute between each pose talking about them. Rather than telling the viewer what to do as they are doing it, she demonstrates, talks, talks some more, then she tells you to begin (each pose is held for 6 breaths). I'd much rather that she explained things as she was doing them. Sure, then you may not get everything the first time, but at least the program would not drag on as it does. The other thing I didn't like about this was the "boing" sound effects of the For Dummies tips. If I'm doing yoga to relax, I want to hear soothing music, not annoying popup sound effects. Sara Ivanhoe does a great job. She does more of a modified sun-salutation, but fine. I think she enriches it. She models it for you, and you follow her. My only pet-peeve, is that she doesn't explain, at all, what it is. If it were more clear, perhaps it would be more meaningful. The book, Yoga for Dummies, by the way, is great. They explain, that the sun-salutation is a 'dynamic posture,' meaning, as I understand it, a series of moving stretches, like, a flowing stretch routine. Flowing stretch routines are really good if you want to build strength and flexibility. The Sun Salutation really helps me with that. This workout is really good for your spine and lungs. Back to the yoga book, (bear with me here) we benefit from the sun's life-giving powers. (Like, no sun, no life) Feuerstein and Payne say ��remember that your body is condensed sunlight!�� So, from a spiritual viewpoint, the light in you (your spirit) salutes its own provider, the sun itself. As far as the ''workout'' goes, it is 5 min. of warm-up, that she flows into the sun-salute. She presents the sun salute, adding the components, piece by piece. It is about 15 min of more strenuous reps. She does about 10 minutes of cool-down, including spine-twist seated-stretches (you have to see it). I'm fairly new to yoga, and this was one of the first DVDs I tried. The format is fairly simple--Sara Ivanhoe introduces 12 yoga poses, which you hold for six (deep) breaths each. The poses are easy in the beginning and end, and hardest in the middle. I can't say enough great things about Sara--she's encouraging and soothing, not grating. Her explanations are thorough and easy to understand. This DVD made me want to check out her other DVDs, which I also like. But I find that I just don't want to do this DVD anymore. At 46 minutes, it's a long workout, yet you only do 12 yoga poses in that time period. That's just too slow for me, and fast-forwarding through all the instruction is not practical. For daily practice, you really need something that flows better than this. Basic Yoga for Dummies is a good introduction to yoga, but you will outgrow it quickly. Look into Sara's Crunch: Candlelight Yoga for a relaxing, flowing practice, with a similar difficulty level. Are you looking to learn yoga, but you can't get to or can't afford classes? While classes are the best way to learn, I believe that this video might be a good second. The title is a bit of a misnomer, in that this really isn't much of a workout. A yoga workout, or a series, is a sequence of poses strung together in a certain way, being done without pausing between. Imagine musical notes being put together to form a song. What this video does, in a very thorough way, is gently teach you a majority of the poses that other yoga videos will use. Each pose is explained thoroughly, but held for only six in-and-out breaths. Another key to correct yoga is the synchronization between breath and movement, and in this, the instructor's cueing is excellent. My advice to you would be to rent this video to learn the asanas (poses) then when you feel comfortable with each pose, grab some of the Yoga Zone beginner videos to string those poses together and make a song of your own. I am a beginner, sort of. I used to do yoga about 5 years ago, but I did it in a class environment and I am really a individual exercise enthusiast. I borrowed several yoga tapes from the public library and this was the one I liked most. I bought this DVD in the 2 pack with beyond basic yoga for dummies, so I hope it will last me awhile. I am fairly new to yoga, and thought this DVD would be useful for all the basics on yoga and it is. It is based on 12 common yoga poses which is referred to as the "Daily Dozen" which are cat pose, mountain pose, standing forward bend, lunge stretch, tree pose, standing side stretch, downward facing dog, cobra, child's pose, seated spinal twist, seated forward bend and final relaxation pose. Sara Ivanhoe leads you through each pose, carefully explaining where you need to be and then you hold each pose for 6 breaths. Sara emphasizes the importance of breathing, which is technically more important that getting the pose perfect. Throughout the routine, there are icons that pop up, tips (helpful hints), myth busters, bewares (red flags), jargon (which helps make yoga terminology easier to understand), plus key things that you need to remember. These are nice but can be a bit annoying when they come up as a funny sound effect accompanies it, which can be distracting when you are trying to concentrate on holding a pose and breathing. This DVD also includes a short intermediate routine which leads you through some of the poses seen in the beginner program, but they are used in a flowing series also called a sun salute. This is usually the next step in a yoga practice once you are familiar with the postures. This segment introduces planks, which are done in the flowing series along with cobras, downward facing dogs, standing forward bends, lunges, etc. You will perform all of these poses at a little faster pace one after another and then they all come together for 3 sun salutes. After this you will do some spinal twists, more stretching and then the final poses. Twelve basic yoga postures are presented here in non-intimidating language. Ivanhoe calmly goes over the fundamentals of each posture as well as the importance of breathing. Anyone who thinks that they need to be initiated into a secret philosophical organization before they can do their first yoga posture will be relieved by this video. Throughout, a narrator makes points about common misconceptions, "Bewares" (or common mistakes) and helpful tips and tricks. The big downside to this tape is that it takes quite some time to get through the twelve postures (just a little over 45 minutes). While most absolute beginners would do well to spend that much time listening to all of the tips on alignment and breathing, slightly more advanced beginners (e.g., they've read a book or even gone to a class) may not derive as much benefit. Even the brand new beginner will probably outgrow this tape sooner rather than later. You may be pleasantly surprised to see Sarah Ivanhoe as the yoga Instructor in this video. She is a certified yoga instructor who presents exercise in a caring, cute way. I love her teaching style because it is nurturing and she never makes me feel rushed. If you have read any of the "Dummies" books you will recognize the quirky little icons. This video is a bit like a book because pages turn and there are little icons that appear with additional information. The bong, bang, zip of the little icons appearing on the screen do get your attention but might not amuse everyone. I was actually not overly enthusiastic about that situation at first, but my mind seemed to start to ignore the zing, zang, zip of the little icons. Jargon Alerts, Myth Buster Icon, Remember Icon and Alerts appear more at the start of the workout than at the end. The modification sections appear in a split-screen format and can be helpful for beginners. The slower pace and extended time for poses present possibilities for beginners. If you are new to Yoga, this might be a great place to start. Intermediate and Advanced users may enjoy the extended time for deeper stretching. Each pose is held for six breaths, but even more time is given due to the explanations. Each yoga instructor has a unique perspective and you pick up new tricks and tips when exercising with a good variety of instructors. Sarah presents a non-intimidating program and explains yoga in easy-to-understand language. You may want to use a yoga mat, strap, chair, pillow during various poses. Sarah gives you as much time as you need to complete and partially master each pose. It takes years to master some poses and after a few years you will be amazed at your progress. The reason yoga never gets boring is because there is so much to learn about each pose. Since Yoga is not a religion and it is not competitive, it is really perfect for everyone. Not only will yoga give you inner peace, you will find that the exercise help you develop your inner strength all while your body starts to look younger and definitely more toned. You might notice increased blood flow and a relaxed state that lasts for hours and hours. Crunch Candlelight Yoga - Candles, sweeping curtains and Sarah is the instructor. Hemalaya Behl's Yoga For Urban Living Series - Authentic and deeply relaxing. I love them all. alimacgraw Yogamind&body - My first experience with yoga, it is yoga in a desert, which is an exotic, authentic and healing workout. Definitely must be done in the dark with candles. Yoga Zone Intermediate Flexibility and Stress release - one of my all-time favorites for stretching and I learn so much from this video, each and every time. OM Yoga - For the more curious who want to learn all the original names for the poses. This is not a video workout and you use flash cards. Perfect for anyone who is advanced or intermediate and wants a system that is highly portable.